THIS TITANIUM AND Aluminum Composite Yoke Assembly utilizes a Dual Point Pickup thus spreading the lifting points of your car. 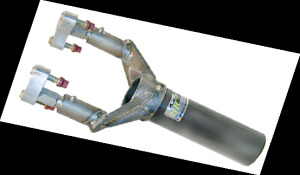 Helps eliminate drive roll and keeps the Torque Tube completely free. You’ll be amazed how much easier car setup will get as well as U-Joint maintenance. This unit will still be free even with a bent Jacob’s Ladder. This Could Make The Difference Of Finishing In Front Or Not!